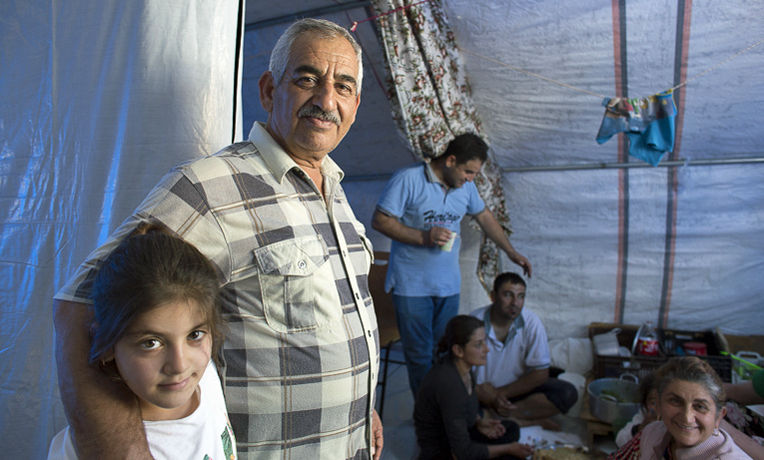 Nissan with his granddaughter and other family members in their tent in Erbil. Staff members and local partners are distributing 80 tons of relief items airlifted by Samaritan’s Purse to the Kurdish region of northern Iraq. Along with other supplies the ministry has purchased in country, the airlifted items—which include children’s clothing, jackets, blankets, socks, hygiene kits, kitchen kits, and tarpaulin—will help thousands of families displaced by ISIS. Seasonal rains are coming and temperatures are expected to drop below freezing this winter, making life even more difficult for families who had to hurriedly escape Islamic State jihadists. Many are living in tents or unfinished buildings without heat. In June, Samaritan’s Purse began a sustained and ongoing ministry to those fleeing ISIS advances. Several weeks later, that effort was significantly increased as Sinjar and towns on the Nineveh plains fell into militant hands. Reports indicate as many as 500,000 displaced persons are now living in the Kurdish area of Dohuk Governorate with another 200,000–250,000 in Erbil, capital of the Kurdish semiautonomous region. THE STORY BEHIND THE PHOTO: Read more about Eman, the first beneficiary to receive an airlifted jacket. 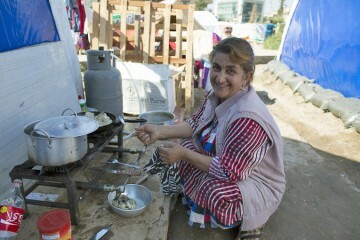 On Monday, October 27, Samaritan’s Purse distributed 128 kitchen kits to residents of the Mar Elia camp in Erbil. Most of the more than 200 families who have found shelter there are Chaldean/Assyrian Christians from the village of Qaraqosh. When speaking among themselves, some use an ancient tongue, distantly related to the Aramaic spoken in Jesus’ day. 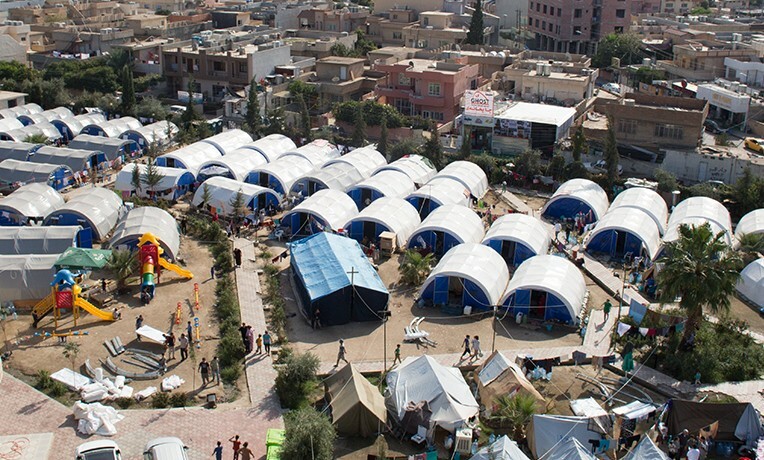 Over the past few months, Samaritan’s Purse has provided food, blankets, mattresses, a large generator, a playground, Christian literature, and 40 dome tents to the camp, which is located on the grounds of St. Elia church. (Elia was a local man killed for his Christian faith in Erbil in 1831.) More relief will arrive in coming weeks as well. Nissan’s wife uses her new kitchen kit. Nissan, 48, and his family were among those to receive a kitchen kit with pots, plates, cups, and utensils. Grateful for the help, they began using the items to prepare lunch. His escape story represents the experiences of the majority of people at Mar Elia. As ISIS advanced on August 6, Nissan’s family joined the chaotic mass exodus from Qaraqosh. They hitched rides in terrible traffic, walked over seven miles, and waited hours at checkpoints to finally reach Erbil. A college-educated pharmacist, Nissan managed to bring along two bags of medicine and not much else. Though they tried to take along some rice and oil, they ended up having to leave it on the streets. After three days in an Erbil hotel, they moved to Mar Ellia. Nissan and his wife today share their dome tent with three daughters, two sons, a daughter-in-law, and 3 grandchildren. “It is very difficult to stay here,” he said. 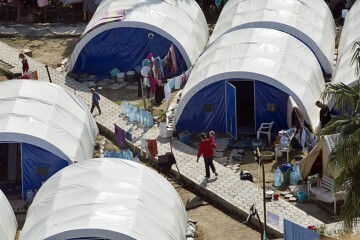 More than 200 families have settled in the Mar Elia camp in Erbil. He has no job and the cost of living is high. (They need money for food, clothing, daily items, etc.) Even though he’s heard that businesses and houses have been looted back at his village, the Christian man wants to return to his lifelong home as soon as it is relatively safe. Father Douglas, who runs the Mar Elia camp, seems to always be smiling and tries to keep the families encouraged. He previously lived in Baghdad and while there was kidnapped, beaten, and shot by those who hate the name of Christ. In broader actions, Samaritan’s Purse has given out more than 3,900 baskets of food since the beginning of this response. Each basket is intended to supply the basic needs of a family of five for one week. Samaritan’s Purse has also distributed more than 4,900 pillows and 7,500 mattresses to displaced families throughout northern Iraq. Beneficiaries include those from Christian, Yazidi, and Muslim backgrounds. 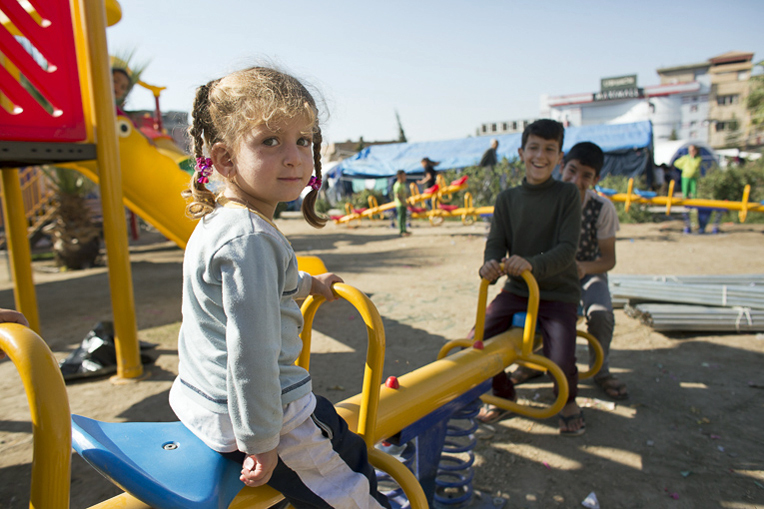 Playground equipment provided by Samaritan’s Purse helps bring joy to children in the camp. Even before the airlifted supplies arrived, Samaritan’s Purse had already reached more than 5,800 families with 20,000 blankets and more than 3,100 kerosene heaters. As we work with our local church partners—some of whom are displaced themselves and have lost nearly everything they own because of ISIS persecution—they are growing bolder both in meeting physical needs and in proclaiming the Gospel. As they help with distributions, they are coming into contact with Yazidis, Muslims, and others who never would have given them a hearing before. “There’s an opportunity for local Christians to reach out to their neighbors like never before,” said Tim Windmeyer, Deputy Director of International Projects, who recently returned from a trip to Iraq. Windmeyer told of a distribution at a mall where 1,200 displaced people had found shelter but were in great need of food. It was late at night, and our staff asked for a handful of local Christian volunteers to help. More than two dozen believers, who had fled Mosul, eagerly volunteered to assist, and they went from family to family welcoming each as they gave out food. As they deliver supplies, Samaritan’s Purse staff members and ministry partners have opportunities to talk about Christ. In addition to food, water, and shelter, our staff and partners have given out more than 1,000 Bibles. More than 3,300 children have recently received Operation Christmas Child shoeboxes. One church that normally accommodates 80 for worship is seeing 200 in attendance. Samaritan’s Purse has been actively delivering relief in northern Iraq since 2007. As Syrian refugees flooded into northern Iraq late last year, Samaritan’s Purse provided food, medicine, clothing, bedding, and kerosene heaters, among other items. In addition, 65,000 Operation Christmas Child shoebox gifts were airlifted to Erbil in January. Please continue to pray for our staff and church partners ministering in Iraq, and for displaced families to receive the help they need as winter approaches.